Once upon a time there was a girl named Summer, whose mother loved her very very very much. Her mother loved her so much that she was not allowed to play outside where someone might grab her, nor go away on sleepovers where there might be an accident or suspicious food. She was not allowed to go away to camp, where she might be squashed by a horse or bitten by diseased mosquitoes, and she most certainly was not allowed to go on the Ferris Wheel at the carnival because (her mother said) the people who maintain the machinery are lazy and not very educated and might get drunk and forget to put a bolt back on and the entire thing could come loose at any moment and fall down and kill everyone inside, and they should probably leave the carnival immediately before it happened. That’s the beginning of Summer in Orcus, by T. Kingfisher and illustrated by Lauren Henderson. T. Kingfisher is the pseudonym of Ursula Vernon, who is an award-winning writer and artist of children’s books and graphic novels. Anything with “T. Kingfisher” on the cover is meant for non-children, as is Summer in Orcus—however, you don’t need to be *too* grown up to appreciate this book. In fact, it was a nominee for The World Science Fiction Society Award for Best Young Adult Book. That’s how I came across it. If you’re a listener to The Incomparable, you might recall episode 412, in which an intrepid band of book-club adventurers (including yours truly) read most-if-not-all of the 2018 Hugo Award nominees for best novel, as well as a few other nominated works. At that time, I hadn’t completed my reading, and time was getting short, so I came up with a cunning plan for the YA category. I decided to read 33% of each book, and then if there was time before voting ended, I’d loop back and finish as many as I could. 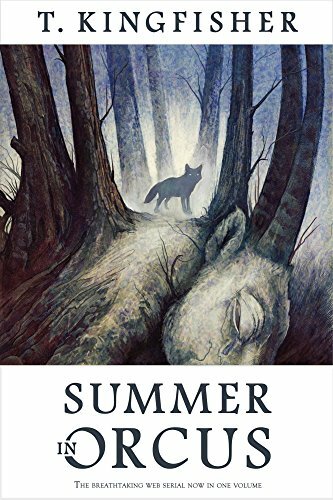 I quite enjoyed the stories published under Ursula Vernon’s name, so I decided to start with Summer in Orcus. Welp. That was a mistake. And now, to why. This book pushed so many of my buttons I felt like a busy elevator. My literary happy-place is anywhere a youngish girl is whisked away from her normal, mundane world into a land of magic and danger (and possibly talking animals). That’s exactly what happens when 11-year-old Summer has a run-in with Baba Yaga, whose chicken-legged hut has come to roost in a neighbouring yard. The old witch promises Summer her heart’s desire! Then the witch turns Summer out into the land of Orcus, where she must figure out where she is, why she’s there, what she should be doing, whom to trust, how to get home, and what exactly *is* her heart’s desire anyway? The twist on all this that had me lapping it up is that Summer in Orcus is incredibly self aware. Summer herself is a fan of this genre, and she’s continually comparing her circumstances to those in Narnia or Oz or similar locales. So rather than approaching her plight as a typical “oblivious” character, she tackles things the way we, as savvy readers, would likely do it. Yes. This book has many puns. If that puts you off, A) I do not understand you, and B) you might want to avoid this one—or just push through because there’s an awful lot more to it than clever puns. The story is not entirely made up of delight and wonder. There are moments of sadness and darkness, including some references to Summer’s mundanely sad backstory. In fact, Summer’s experience dealing with her mentally ill mother is what honed the very skills she needs to succeed in Orcus. I’ll say no more than that, except to tease the existence of characters like the the Forester, the Warlord, and the Queen-in-Chains. This book was originally published as a free serial, with chapters released twice weekly, and while I can kinda see that structure, I didn’t know it going in, and I wouldn’t have recognized it except for stumbling across that fact on Goodreads. To me it was an engrossing journey-quest that had me laughing and crying and wanting much, much more. I do hope I’ll get it. In closing, I’d like to warn you all: Antelope women cannot be trusted.